A good start in leading a clean and healthy life is by inculcating hygiene practice from a young age. A good practice is by keeping their hands clean at all times but there will be situations whereby tap water and hand soap are not easily available. What can we do when faced with such situations? This is where wet wipes come in handy for both the parents and the kids. Carrie Junior, a range of children’s toiletries which has been in market for over 19 years is a leading baby and kids personal care brand in Malaysia introduces new Carrie Junior Funtime Wipes. Suitable for families with young children, new Carrie Junior Funtime Wipes is convenient for both parents and kids alike with its easy to carry pack of 30 wipes or the family pack of 80 wipes for the home or in the car. For school going children, it would be ideal to have a packet in their school bags. New Carrie Junior Funtime Wipes will come in handy as children are constantly exposed to harmful bacteria and viruses when they are going about their daily school routine and extra-curricular activities. 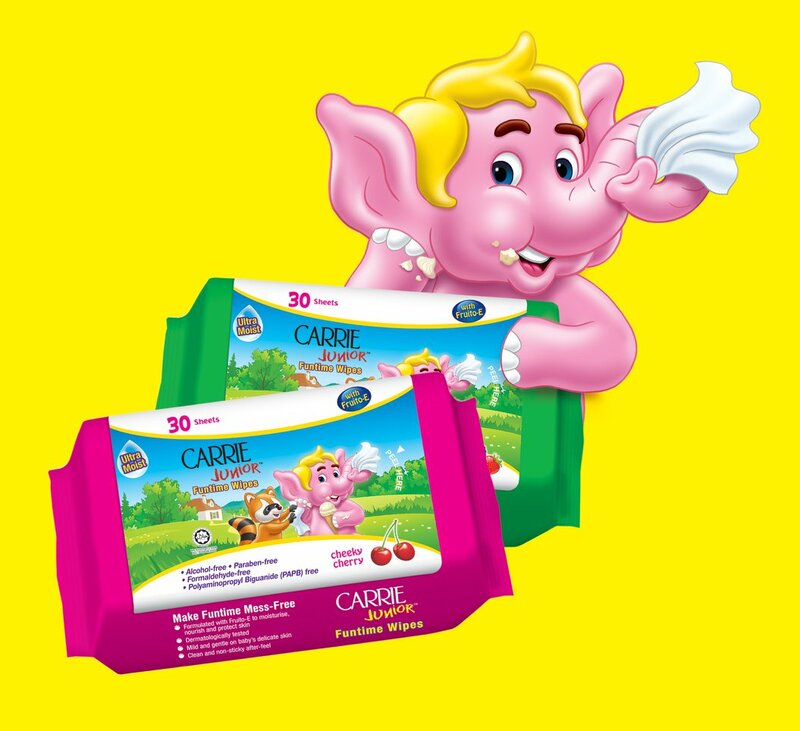 A simple task of wiping their hands with the Carrie Junior Funtime Wipes before and after meals, playing outdoors, and after going to the bathroom will keep their hands clean and stays hygienic. Available in two delightful fruity variants of Cheeky Cherry and Smoothie Berries, new Carrie Junior Funtime Wipes are specially formulated with the Carrie Junior signature ingredient, Fruito-E, which is a natural combination of fruit extracts. Fruito-E is rich in vitamins and nutrients to help nourish and moisture skin. New Carrie Junior Funtime Wipes is alcohol-free, paraben-free, formaldehyde-free and are hypoallergenic. Dermatologically tested and certified halal; the wipes are designed to be ultra-moist. They are also mild and gentle enough to be used on sensitive and baby’s delicate skin. 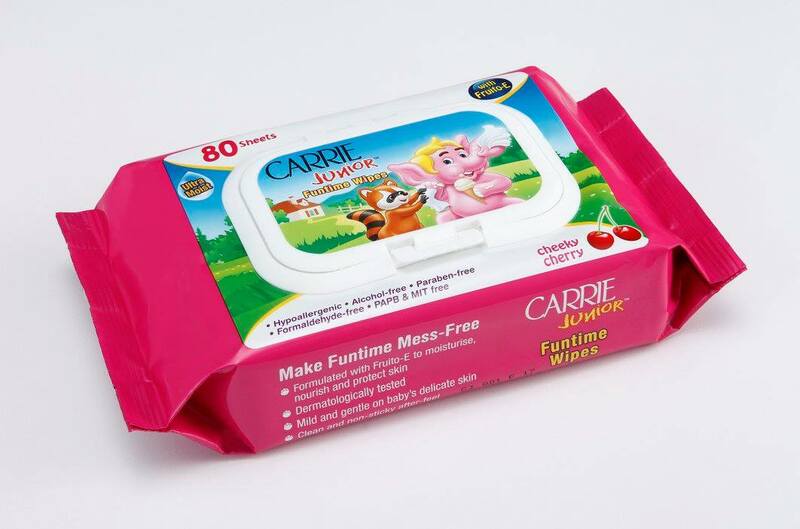 The New Carrie Junior Funtime Wipes is a great solution for on the go, travelling, outdoors as well as before and after meals. Best of all is that it leaves a comfortable, non-sticky feeling and with a delightful; fruity scent. Both Carrie Junior Funtime Wipes are available in convenient and travel handy packs of 30 sheets priced at RM7.30 (WM) / RM7.70 (EM) or the large family pack of 80 sheets priced at RM9.00 (WM) / RM9.50 (EM). *Price inclusive of GST.